This Application is still under development. The documentation and or any information you find pertaining to this product may be different from the final release. GOAL: Provide a solution for end users to easily install software on their computer and keep it up to date, regardless of their computing experience. 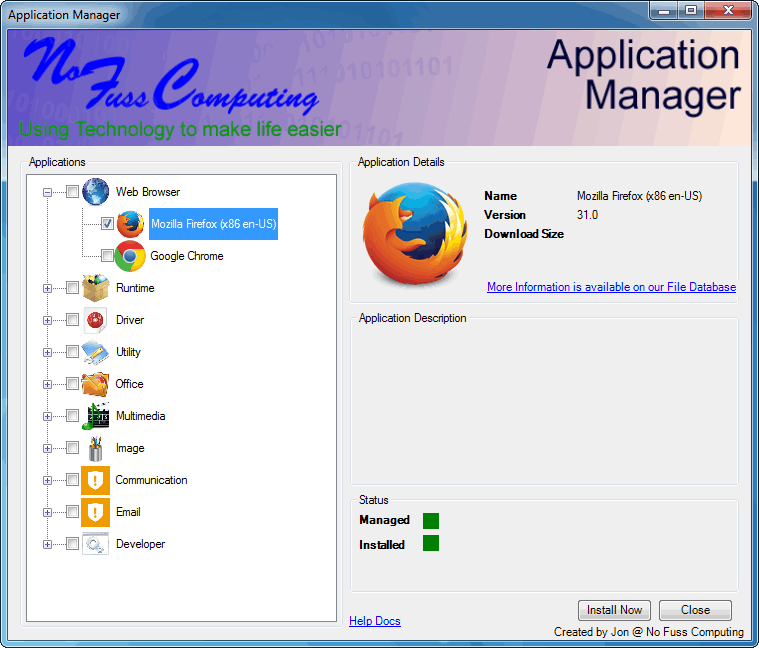 As soon as you click install the Application Manager Confirms the software is not already installed, if not; downloads the application installer including any dependencies, installs the application, confirms the application installed and runs any additional tasks. All of this in the background without any user intervention. Please check out our features page for more information. To make life easier and a little more logical we have broken our documentation up in to two sections. Administration Documentation, for those who want to get their hands dirty. User Documentation, how to use the interface and application in general. Bug and Feature Tracker, Request a feature or notify us of a bug. Changemap, see what we have implemented.